During Spring Break, two groups of Upper School students immersed themselves in the beautiful complexities of India and Taiwan as part of this year’s Global Education trips. They took risks by jumping off cliffs into the waters of the Goan jungles. They deepened their appreciation of art, examining the intricacy and colors of the City God Temple in Taipei City. They strolled through the bustling streets of Mumbai, getting lost in the symphony of noisy cars, busy pedestrians and vendors. They engaged in bilingual conversations with students at a Taiwanese school on income disparity, the environment and diversity. 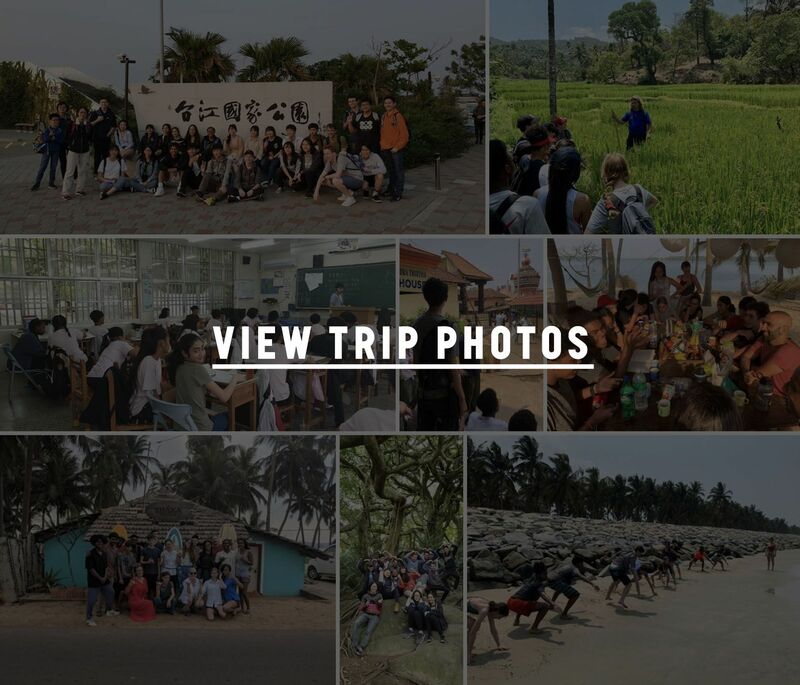 Throughout the trip, students absorbed themselves in the disparate lifestyles, religion, history, foods and customs, and uncovered parallels within our own country. In India, a group of thirteen visited Mumbai, wandering the streets and taking in all the restless city had to offer, wrestling with the question of why many residents of this ethnically and diverse city still call it Bombay. They were delighted to find a synagogue, Zoroastrian fire temple and Anglican church all inhabited the same small part of town. Students took in the local art scene before boarding the overnight train, the Mangalore Express, to Goa to continue their backpack expedition and experience life 8,000 miles from home. Their adventure continued with a trip to the local salt pans where they discussed Gandhi’s Salt March and the importance of salt to human societies, especially in the tropics. The group then hiked into the Goan jungles where they learned how cashew plantations contribute to deforestation. They also visited the older Portuguese parts of the state to consider it’s Portuguese and Catholic heritage. Following Goa, the group visited Kochi in Kerala where they savored local style thali before heading up to Karnataka. Students visited Kodi Bengre Beach to indulge in the warm waters and do a little surfing. As they journeyed down the Konkan and Malabar coasts of West India, the group considered the value of living by water and reflected on their own lives in the concrete jungle. The following day, they traveled to the Krishna Temple in Udupi and spent time at the Kodi Bengre Elementary School where they were able to interact with students. 4,000 miles away in Taiwan, their peers visited 29 students from the Nanda Fuzhong school where they had engaged in a joint project, “Future Cities,” which addressed socio-economic challenges in Taiwan and New York. The students broke for a basketball game before heading off to the night markets and experiencing the sensory overload of bright lights and spices that filled the air. The following day, it was back to the blackboard for two days with a visit to Bin Mao Junior High School where Friends students attended language and math classes. The students also worked diligently preparing a presentation on the School and their home city — completely in Chinese — to Bin Mao students. The group also delved into learning about the community through Bin Mao’s vocational training program, a volunteer beach cleanup, lessons in traditional Paiwanese dancing, and visits to museums. In their final days of the trip, students roamed the outside of Taidong with the Bunong tribe, gaining knowledge of their culture and customs in the winding Luan Shan Forest Museum. Afterward they visited the Children’s Book House, an afterschool program that provides social and emotional support for students struggling with family issues. They ended their time in Taiwan with a thought-provoking visit to the Museum of Human Rights where they heard the heart-wrenching first hand story from a survivor of the atrocities under the Chiang Kai Shek regime. Students touched down in New York with a renewed sense of social responsibility and a better understanding of the interconnectedness of world events and global issues.The Taiwan trip leaders were David Bell, Kristen Fairey, and Joanna Wang. The India trip leaders were Bram Hubbell and Leitzel Schoen.